With no Silva or GSP, the UFC truly begins the next evolution of fighters. When the UFC kicks off their 2014 fight schedule next weekend in Singapore, it will mark the first time in six years that the organization has not began the year with Georges St-Pierre and Anderson Silva standing as the undisputed champions of their respective weight classes, and the first time since the latter’s victory over Rich Franklin at UFC 64 that neither of the iconic fighters had UFC gold around their waists. 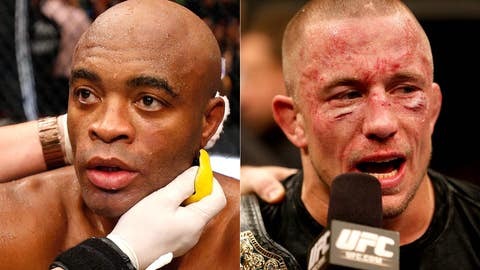 Though 2013 undoubtedly produced some of the best fights to ever grace the Octagon and featured a string of wildly entertaining events in succession to close out the year, it will invariably be remembered as the year the sport lost two of it’s greatest champions. St-Pierre made the conscious decision to vacate the welterweight title and take a sabbatical from competition, his concerns over his health and well being hitting home even more as Silva laid on the Octagon canvas in agony after a broken leg ended his second bout with Chris Weidman Saturday night at UFC 168. 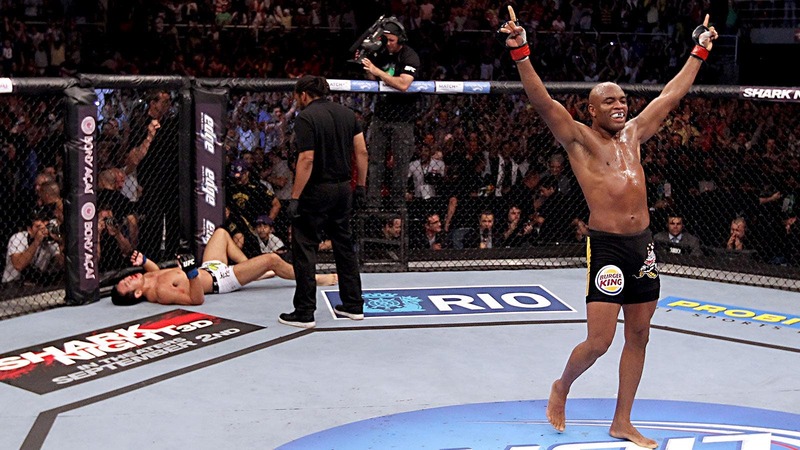 For a combined 4,521 days, Silva and St-Pierre dominated the middleweight and welterweight divisions respectively, turning back 23 consecutive opponents between them, including an astonishing 19 straight successful title defense - 10 for Silva, 9 for St-Pierre. They are arguably the two greatest fighters in UFC history and they will be sorely missed. But the UFC is better heading into the New Year because of it. As great as both men were as champions, they had exhausted all potential challengers and their divisions had grown stale as a result, each successive title defense getting more difficult to market opponent after opponent was turned aside. It’s no coincidence that the most interesting fight each man had in the last year was the bout where many believed we could finally see them dethroned. Fans had become apathetic in regards to the former champions – their dominance no longer generating the same kind of interest in their bouts, their flawless execution and otherworldly skill no longer enough to satiate their appetites. Being without rivals wasn’t viewed as impressive, but an impasse towards getting excited to seeing St-Pierre and Silva compete. Their fights felt like a foregone conclusion that no amount of pre-fight marketing and promotion was able to alter until Weidman and Johny Hendricks were finally given their chance to challenge Silva and St-Pierre. Now with Weidman atop the middleweight division and Hendricks poised to face off with ‘Ruthless’ Robbie Lawler for the vacant welterweight title, there is new life in the two divisions, and new match-ups that can re-energize the weight classes. Potential challengers no longer need to be viewed in terms of their history or relationships with the men at the top of the divisional ladder. Things are completely wide open in the welterweight ranks, with Hendricks having only faced two members of the Top 10 - Carlos Condit and Martin Kampmann - while the resurgent Lawler has only faced one under the UFC banner, Rory MacDonald. And most fight fans would not be opposed to seeing Hendricks and ‘The Natural Born Killer’ run it back over five rounds if push came to shove, either. Middleweight is full of possibilities as well, as new contenders have emerged over the last 12 months, and Mark Munoz stands as the only fighter ranked in the Top 10 to share the cage with the reigning champion, outside of Silva, of course. Those potential championship pairings - and the unlimited number of entertaining match-ups that help establish future challengers going forward - bring a new energy to weight classes that have been lacking intrigue for the last year or two. There is more to it than just fresh match-ups though. Having St-Pierre exit stage left and Silva no longer reigning supreme and looking sublime inside the Octagon forces the UFC to focus their attention on a new cast of champions and potential stars as they look to replace two of the biggest names in the organization’s 20-year history. Weidman stands at the top of that list, alongside women’s bantamweight champion and fellow UFC 168 winner Ronda Rousey and light heavyweight titleholder Jon Jones. He’s 29-years-old, undefeated, and coming off consecutive victories over the greatest fighter of all-time. Lingering questions and catastrophic injuries aside, there is no denying that his bout with the new, improved, and downright scary version of Vitor Belfort already stands as one of the most compelling bouts of 2014. With champions Cain Velasquez and Anthony Pettis both sidelined following surgery, a greater share of the spotlight will now be afforded to the lighter weight classes as well, where champions Jose Aldo, Dominick Cruz, and Renan Barao have all put together lengthy winning streaks, while challengers like Ricardo Lamas and Urijah Faber have done the same and will look to follow in Weidman’s footsteps this year by unseating a long-reigning champion. Flyweight champion Demetrious Johnson deserves greater attention and an opportunity to really shine following his blistering first-round knockout win over Joseph Benavidez earlier this month, and three consecutive successful title defenses on FOX. While none of these fighters may blossom into the kind of pay-per-view draw that St-Pierre was - or even match Silva, who started drawing better numbers later in his reign - they are no less deserving of the attention and recognition that comes with being UFC champions. Having established and iconic fighters like St-Pierre and Silva around soaks up a lot of the spotlight, making it harder for the remaining members of the elite class to get noticed, but that should be less of a problem going forward. Truthfully, 2014 is likely to be a transitional year for the UFC. That may sound odd considering that the two longest reigning champions parted ways with their belts this year, but St-Pierre’s departure came late in the year and Weidman’s place atop the division wasn’t solidified until Saturday night; some would likely even argue he still hasn’t cemented himself as the best middleweight in the world yet. With a hectic and ambitious schedule set for the upcoming year and domestic fans hedging on everything from free televised events to backing clearly dominant fighters because of how they fight or how much they weight, having a year dedicated to gathering momentum and reloading as the next generation becomes the now generation is not a bad thing.